On September 17th, 1787, the United States Constitution was approved by delegates to a special convention with the goal of creating a set of reasoned legal standards for those who would be elected to lead and share in the welfare of their new nation. Since its ratification, the Constitution has provided the framework for a democratic form of government that has distinguished domestic leadership and its impact on the American populace over the past 230 years. In more specific terms, the content found in this document outlines the continued aspiration for shared and balanced authority between the three branches of government – executive, judicial, and legislative not only nationally, but also on the state and local level. The original authors were also aware that changes might be needed over time, and to date there have been 27 separate amendments made with the first ten comprising the Bill of Rights and the rest covering different aspects of civil equality. Since its introduction, the Constitution has not only been a part of secular society since its official release, but from an academic perspective this text has been studied widely and given rise to special courses and independent study that stands alone, or paired with various disciplines from law to sociology to history among others. A major part of this rise in wider interest came after the American Revolution concluded with the need for schools, growing literacy rates, and spread of print media as a means of educational outreach. These incentives helped to create the means of inform the public about legislative developments that impacted upon the citizens of a new and developing country. The first unveiling of the Constitution to the masses came two days after it was finalized through the efforts of John Dunlap (1747-1812) who was the founding editor of The Pennsylvania Packet and Daily Advertiser, the first daily newspaper in the United States. This milestone gave rise to a series of printed books that offer full-text treatment along with details on the process of different sections were crafted, commentary on the subject matter, and significance of the final content depending upon each individual volume and its particular focus. 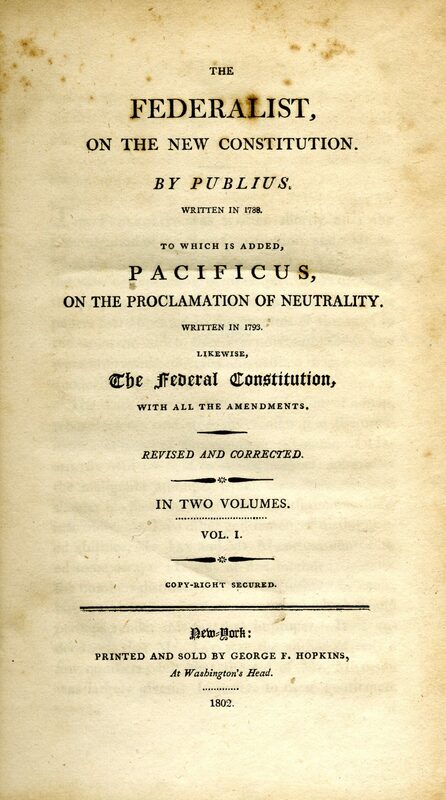 The examples presented in this exhibit represent not only the first published copy, but also select early nineteenth century works that cover the words of first president George Washington, early amendments, and perspective from the New Jersey delegation representing the third state to officially ratify the Constitution. Examples from our collection will be on exhibit through September, 2018 in the First Floor foyer of Walsh Library located across from the stairs and elevator. For additional background on the United States Constitution and questions about relevant holdings and other research topics please feel free to contact us at – archives@shu.edu or (973) 761-9476.